We've all heard the myths regarding the cause, treatment, and prevention of muscle cramps that occur during or after exercise (termed exercise-associated muscle cramps or EAMC). We're told that to relieve EAMC you should eat bananas, mustard, or pickle juice, right? Is there any evidence for or against any of these so-called remedies? Actually, there is. Don't tell this to a cramping 350-pound lineman! The truth is that EAMC can be very painful, affect athletic performance, and decrease overall quality of life. In fact, in 2011, tennis player Sabine Lisicki was just a point away from upsetting the nunber three seed in the French Open , but experienced debilitating whole body EAMC. She lost the match and had to be carried off the court on a stretcher. To those of us who get EAMC, they're very serious! This is one of my favorites. Recently, scientists gave men no, one or two servings of bananas after they biked in the heat for an hour. They measured blood potassium and observed that when one serving (about 1.5 bananas) was ingested, their potassium level did not change for 60 minutes! 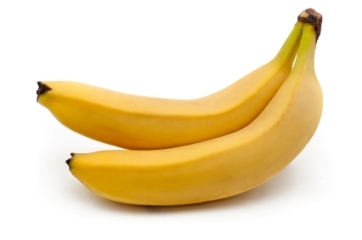 When two servings were ingested (about 3 bananas), it took 30 minutes to see a change in blood potassium level. (1) The takeaway message: if you've got a muscle cramp, eating bananas is too slow to relieve it. You're better off stretching the muscle (see tip #4 below). Whether drinking pickle juice prevents cramps or not is unknown. However, drinking pickle juice actually does relieve an ongoing cramp faster than drinking water or nothing at all. (2) While we're not sure how it relieves cramping, what we do know is that it probably doesn't work because of the sodium or other electrolytes in the juice, since blood electrolytes don't change within 1 hour after you ingest it. (3) The problem is that it takes longer than stretching to work and may not work for everyone. Like bananas, the nutrients in mustard doesn't get into your blood fast enough to change blood electrolytes and relieve an exercise-associated muscle cramp. In fact, scientists recently observed that when subjects ate 30 packets of mustard after intense exercise in the heat, their bllood sodium and potassium levels did not change within an hour of ingestion. (4) Better to just enjoy it on your hot dog than rely on it to stop your muscle cramp. Does it surprise you that most research on cramping actually confirms it's probably not dehydration that causes EAMC? In two recent studies (5,6), subjects biked with just one leg in extreme heat until they lost 3% to 5% of their body weight (which took 2.5 to 4.5 hours!). The other leg did not exercise. Scientists measured cramp risk and found that when fatigue was minimized but subjects were dehydrated, mild to severe dehydration did not impact cramp risk. Evaluate how you start exercise. Do you or your child start exercise well-hydrated, rested, and well-nourished? Most evidence points to cramps being the result of changes in an athlete's nervous system. Fatigue may play a role. We know that many people start exercise dehydrated and/or do not eat properly. Dehydration can lead to premature fatigue, and if you don't eat, you won't have the energy to exercise. Both may lead to early EAMC. Evaluate your training. Some training techniques like plyometrics , in theory, may help prevent cramping by focusing on the nerves that are thought to cause EAMC. If you or your young athlete cramps, take notes about what you or they did the day before and the day of the exercise session. Was it hot outside ? Were you thirsty before you started working out? Did you skip breakfast ? Did you try exercises that were new to you? Did you try to push yourself a bit more than usual? These may help you determine why you or your young athlete cramped that day. Slow down and rest. Many people can tell when a cramp is about to occur. They either start to get "twitching" in their muscles or just know they're about to cramp. If you are your child feels this, slow down and stretch the affected muscle. This will usually remove the cramp. Stretch. There is no evidence that regularly stretching your muscles will prevent EAMC. However, if you have an EAMC, there is no better treatment. Stretching relieves EAMC almost immediately, doesn't cost any money, and anyone can do it! The bottom line: Exercise-associated muscle cramps are likely due to several different causes. Moreover, it's likely that those causes differ for each person. The best way to prevent them is for athletes to thoroughly examine themselves to see what clues they can learn about why they cramped. These may help you find the triggers that cause cramping for you. And if you get an EAMC, stretch it out and take a breather. Your body may just be trying to tell you to slow it down a bit. Kevin Miller, PhD, ATC, is Associate Professor in Athletic Training at Central Michigan University. 1. Miller K. Plasma potassium concentration and content changes following banana ingestion in exercised males. J Athl Tr. 2012;47:648-654. 2. Miller K, Mack G, Knight K, et al. Reflex inhibition of electrically-induced muscle cramps in hypohydrated humans. Med Sci Sports Exerc. 2010;42:953-961. 3. Miller K, Mack G, Knight K. Electrolyte and plasma changes following ingestion of pickle juice, water, and a common carbohydrate-electrolyte solution. J Athl Tr. 2009;44:454-461. 4. Miller K. Electrolyte and plasma responses following pickle juice, mustard, and deionized water ingestion in dehydrated humans. J Athl Tr. 2013 (in press). 5. Miller K, Knight K, Mack G, et al. Three percent hypohydration does not affect the threshold frequency of electrically-induced muscle cramps. Med Sci Sports Exerc. 2010;42:2056-2063. 6. Braulick K, Miller K, Albrecht J, Tucker J, Deal J. Significant and serious dehydration does not affect skeletal muscle cramp threshold frequency. Br J Sports Med. 2012;47:710-714.